Everything I’ve seen suggests that there were two movements into South Asia from the north/west. The Brahui/Baloch are very distinctive in comparison to the Kalash/Pathan/Burusho. This might be a function of continuous gene flow from distinct regions to the west as well, especially in the case of the Brahui/Baloch, who have had associations as far afield as Oman due to their geographic proximity. Here is my messy attempt to fit South Asians onto the Lazaridis 2014 diagram for Europeans. Explanation: the South Asian population is very complex. It is a huge area that has attracted numerous inward migrations, including some from East Asia that I do not show, as they are distinct from the simple ASI/ANI model of Reich et al. 2009. ASI: a migration from Africa via India to Australia, maybe 30-40 ka earlier than the next out-of-Africa migration. Palaeolithic: mtDNA haplogroup U2 (at least) from the next dispersal out of Africa. Component in Dravidian-speakers? I'm sure experts on South Asia can improve on this. How do the above fit in with this (or is this accurate)? Can someone draw in the names of the populations at the nodes in the above map, if that is still the map we are considering accurate? I have very limited understanding on these concepts. Is "Basal Eurasian" the first node out of Africa in Gujarat in western India? Is Nadar the Onge's cousin ASI? For some reason the idea that the later groups actually populate the subcontinent is absurd to me. Populate as in take over the demographics such as Europeans in Australia or Canada or USA, as opposed to dominate culturally but minor impact genetically like Spaniards in Peru or Bolivia. They probably even took charge on the Y-Hg scene, but a densely populated fertile land that is the first center of out of Africa population can hardly be affected genetically on the overall sense autosomally. Am I wrong for this assumption? I understand that South Asia was also not carrying 1.5 billion people forever, but it must have always outnumbered Central Asians by 20 to 1. I don't have a dog in this race either way, just trying to understand the current theories better. 1. The Genographic map is for a very early period, at least 50000ybp. OoA event is undifferentiated ANI+ASI, I suppose. An Out of southern India event to the West - this would be ancestral ANI and an out of southern India event to the east ancestral ASI. From this movement to the east a wrap-around to the west joining ancestral ANI. 2. In the historical period I would say that there has been little genetic effect on the Subcontinent as the preceding population levels have been immense. Confirmed historical movements have included those of Greeks, Arabs, Turko-Mongols, and Europeans in that order. Assuming that these movements were male mediated we see a minimal to trace impact. 3. So we have to look at the periods, between 1 and 2 above. My read is that the wrap-around portion entered India and not only from the north-west. They came down all the antecendent rivers of the Himalayas. While indeed India always sustained a large population, there was significant space especially in the densely forested Indo-Gangetic plains to clear. The first settlements were perhaps the riverine diaras and along the Himalayan terrai. This is the ingress that Reich, Moorjani, and associates, are seeing as a late admixture event. The period of this admixture may well be after the ingress. The reason we are not seeing clear evidence of movements in components such as MA1's ANE is that that is far too old. Its age makes it somewhat medial to the Out of India event and the later ingress. Finally we will need specimens from South Asia, Upper Asia, and West Asia to confirm any of this. Higher resolution will enable us to clarify these movements. Last edited by parasar; 11-11-2014 at 04:17 PM. We know there's 5 distinct population sources for South Asians. I think the migrations would be, in order: #1, #4, #2, #5, #3, #6 with perhaps 3 and 5 interchangeable. This is totally speculative based only on the amounts of these components. I don't see much evidence for recent invasions/migrations at all. The closest thing has been a sort of link between Northwestern Europe and South Central Asia (Jatts, Pathan/Pashtun, Kalash, etc) which is very slight on average. This might be related to the WHG-UHG component. It's hard to tell because the Atlantic-Mediterranean component, which is also part of that link, is shared throughout South Asians and is linked to the SW-Asian-like ENF in South Asians (South Indians getting IBD matches with Irish), so it might just be a fluke. The WHG-UHG component probably arrived packaged with ANE and other components and probably corresponds to those Indo-Aryans. If IBD/IBS is anything to go by, we have a lot of matches with Western Europeans as well as Eastern Europeans where we'd only expect Eastern Europeans. 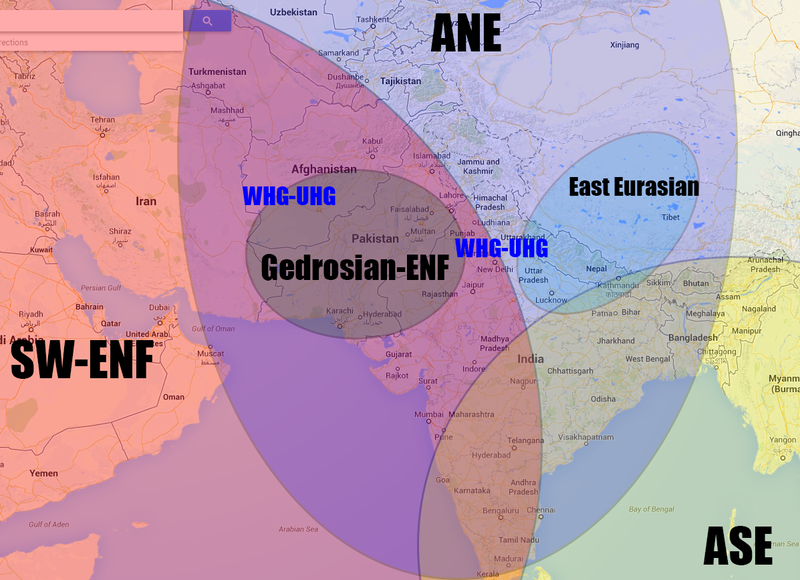 Gedrosian-ENF seems to be "boxed in" from all sides. I think this event might have taken place less than 10,000 years ago, but before probably 3500-4000kybp. My guess is that it was probably a related southwestern Caucasus/eastern European/northern Middle East/Anatolian component that moved this far out and genetically drifted. Either that or the movement is more widespread but ground zero of the genetic drift for whatever social causes was Gedrosia (perhaps linked to civilizational rise/collapse). The high Siberian/Beringian/Arctic/etc indicates this East Eurasian content is very old (as opposed to NE-Asian which more resembles existing East Asians and is probably a little more legit if paired with real IBS/IBD matches to East Asians). Last edited by Dr_McNinja; 11-11-2014 at 04:28 PM. India has been under-represented in genome-wide surveys of human variation. We analyse 25 diverse groups in India to provide strong evidence for two ancient populations, genetically divergent, that are ancestral to most Indians today. One, the ‘Ancestral North Indians’ (ANI), is genetically close to Middle Easterners, Central Asians, and Europeans, whereas the other, the ‘Ancestral South Indians’ (ASI), is as distinct from ANI and East Asians as they are from each other. By introducing methods that can estimate ancestry without accurate ancestral populations, we show that ANI ancestry ranges from 39–71% in most Indian groups, and is higher in traditionally upper caste and Indo-European speakers. Groups with only ASI ancestry may no longer exist in mainland India. However, the indigenous Andaman Islanders are unique in being ASI-related groups without ANI ancestry. Allele frequency differences between groups in India are larger than in Europe, reflecting strong founder effects whose signatures have been maintained for thousands of years owing to endogamy. We therefore predict that there will be an excess of recessive diseases in India, which should be possible to screen and map genetically. We highlight two implications of these dates. First, nearly all groups experienced major mixture in the last few thousand years, including tribal groups like the Bhil, Chamar, and Kallar that might be expected to be more isolated. Second, the date estimates are typically more recent in Indo-Europeans (average of 72 generations) compared to Dravidians (108 generations). A jackknife estimate of the difference is highly significant at 35 ± 8 generations (Z = 4.5 standard errors from zero) (Table 1). A possible explanation is a secondary wave of mixture in the history of many Indo-European groups, which would decrease the estimated admixture date. Last edited by Jean M; 11-11-2014 at 05:03 PM. ANE is found in Western Europeans as well as Eastern Europeans. Indo-European languages spread right across Europe with few exceptions. Indian populations are classified into various caste, tribe and religious groups, which altogether makes them very unique compared to rest of the world. The long-term firm socio-religious boundaries and the strict endogamy practices along with the evolutionary forces have further supplemented the existing high-level diversity. As a result, drawing definite conclusions on its overall origin, affinity, health and disease conditions become even more sophisticated than was thought earlier. In spite of these challenges, researchers have undertaken tireless and extensive investigations using various genetic markers to estimate genetic variation and its implication in health and diseases. We have demonstrated that the Indian populations are the descendants of the very first modern humans, who ventured the journey of out-of-Africa about 65,000 years ago. The recent gene flow from east and west Eurasia is also evident. Thus, this review attempts to summarize the unique genetic variation among Indian populations as evident from our extensive study among approximately 20,000 samples across India. Last edited by Jean M; 11-11-2014 at 04:40 PM. This to me signifies a real split, and then separate sourcing into the population. We see that in Europe too, ANE is far more associated with WHG than with the basal portion of EEF. This scenario of human dispersals is broadly consistent with the archaeologically-motivated hypothesis of an early southern route migration leading to the colonization of Sahul and East Asia2 but also further clarifies this scenario. In particular, our data provide no evidence for multiple dispersals of modern humans out of Africa, as all non-Africans have statistically indistinguishable amounts of Neandertal genetic material.12,18 Instead, our data are consistent with a single dispersal out of Africa (as proposed in some versions of the early southern route hypothesis1) from which there were multiple dispersals to South and East Asia.